A program is defined as a group of related projects, subprograms, and program activities managed in a coordinated way to obtain benefits and control not available from managing them individually. A portfolio refers to a collection of projects, programs, sub-portfolios, and operations managed as a group to achieve strategic objectives. create a unique product, service or result. scope of its program components. change managed and control. Programs are managed in manner that accepts and adapts to change as necessary to optimise the deliver of benefits as the programs components deliver outcomes and / or output. Portfolio managers continously monitor changes in the broaded internal and external environments. Planning Project Managers progressively elabrote high - Level information into detailed plans throughout the project lifecycle. Programs are managed using high level plans that track the independencies and progress of program components. program plans are also used to guide planning at the component level. Portfolio managers create and maintain necessary process and communication relative to the aggregate portfolio. Management Project manager managing the project team to meet the project objectives. Programs are managed by Program managers who ensure the program benefits are delivered as extected, by coordinatiing the activities of a programs components. Portfolio managers may manage or coordinate the portfolio management staffs, or program and project staffs that may have reporting responsibilities into the aggregate portfolio. Monitoring Project Managers monior and control the work of producing the products, services, or results that the project was under taken to produce. Program managers monitor the progress of program components to ensure the overall goals, Schedules, budget, and benefits of the program will be met. Portfolio managers monitor strategic changes and aggregate resource allocation, performance result, and risk of the portfolio. Success Success is measured by product and project quality, timelineness, budjet complaince and degree of customer satisfaction. A programs success is measured by the programs ability to deliver its intented benefits to an organization, and by the programs efficiency and effectiveness in delivering those benefits. Success is measured in team of the aggregate investment performance and benefit realization of the portfolio. Repetitive ongoing execution of activities and processes that produce the same product, service or result. Operations require business process management whereas projects require project management. Scope, Quality, Schedule, Budget, Resources, and Risks. 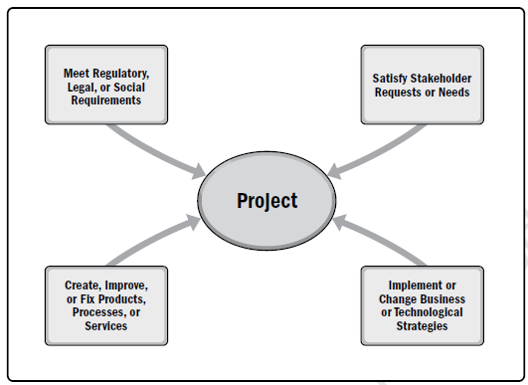 A project life cycle includes all the phases required for a project to create a product, service, or result. 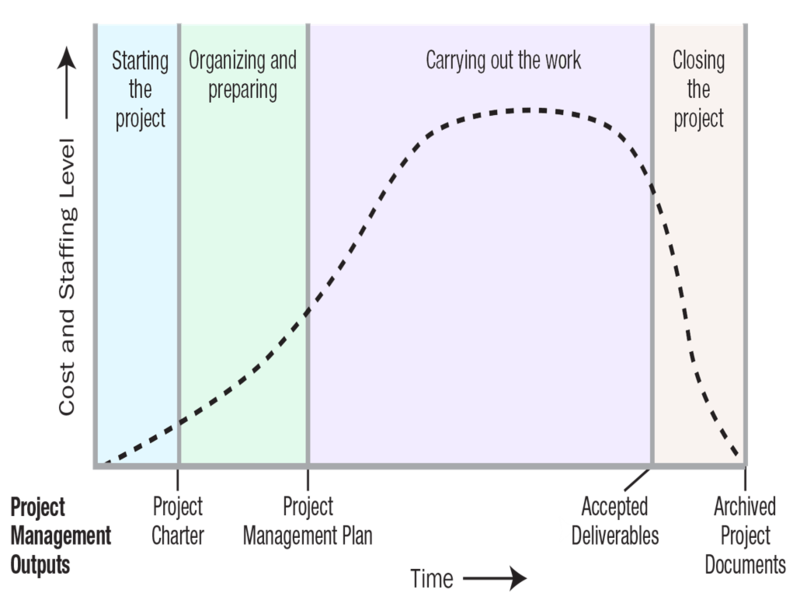 The project life cycle is industry specific and can be different for each project. 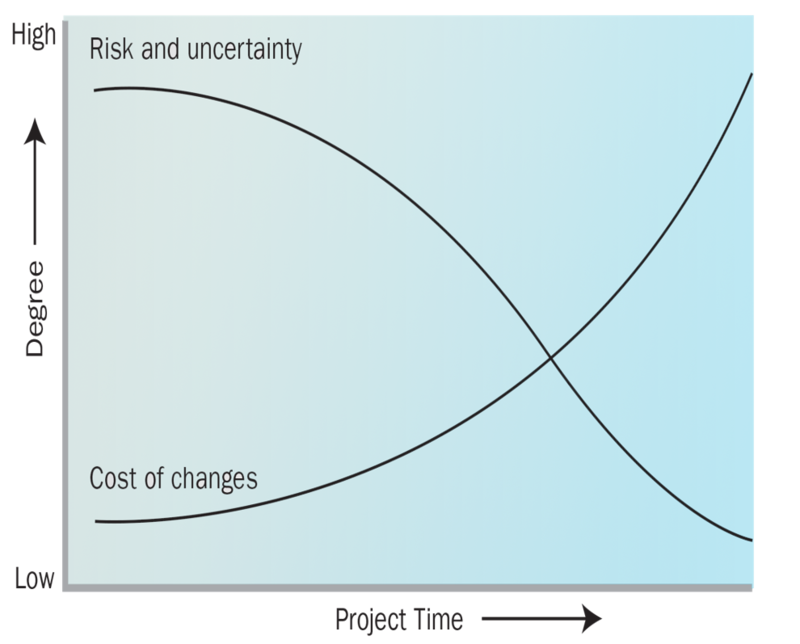 The project life cycle is divided into project phases for better control. A management review is held at the end of a phase, and often includes a decision regarding whether to start the activities of a subsequent phase. Phase-end reviews are also called phase gates, kill points, decision gates, milestones, phase exits, and toll gates. A phase-end review can also be used to terminate the project if necessary. The two basic types of phase-to-phase relationships are a) sequential and b) overlapping. Predictive life cycles are ones in which the project scope, and the time and cost required to deliver that scope, are determined as early in the project life cycle as practically possible. Iterative and incremental life cycles are ones in which project phases (also called iterations) intentionally repeat one or more project activities as the project team’s understanding of the product increases. Iterations develop the product through a series of repeated cycles, while increments successively add to the functionality of the product. Adaptive life cycles (also known as change-driven or agile methods) are intended to respond to high levels of change and ongoing stakeholder involvement. Adaptive methods are also iterative and incremental, but differ in that iterations are very rapid (usually with a duration of 2 to 4 weeks) and are fixed in time and cost. A product life cycle may have several projects (hence multiple project life cycles) and operations. The product phases are generally sequential and non-overlapping, e.g., a project undertaken to design a new desktop computer is only one phase in the product life cycle. To know more about the Project Management and PMP certification Training program, contact us at +91 9566008068.